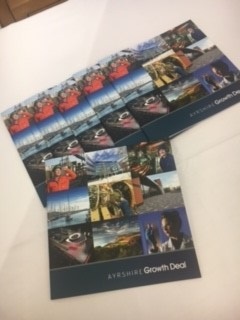 She has been working with the three Ayrshire Councils and the Scottish Council for Development and Industry to press for financial support to create thousands of new jobs in Ayrshire. 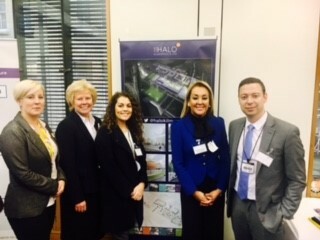 Her latest involvement was lobbying members of the Westminster Parliament and the House of Lords at an Ayrshire promotional event in London. 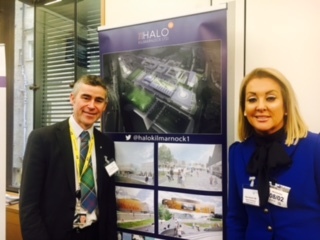 The HALO is an integral element in the proposed Ayrshire Growth Deal intended to stimulate the Ayrshire economy and will in itself create over 900 jobs. The HALO, is a £65 million multi-faceted regeneration around an Urban Park that will form a commercial cultural, leisure and life-style quarter of the town. It will include an Innovation Technical and Enterprise Hub, covering Cyber and Digital sectors, in conjunction with the University of West of Scotland. 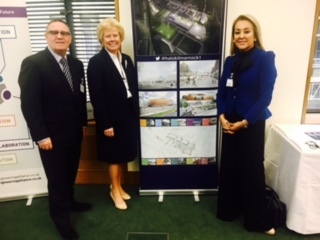 Aspects of the development will complement the roles of the adjacent Ayrshire College and there will be a special focus on engineering, manufacturing and textiles with a centre for small and medium sized businesses. There will be a conference and exhibition centre and a year round leisure and water sports facility which will include Britain’s first Surf Wave pool. In addition, 100 homes will be built for key workers. The HALO will incorporate a renewable energy centre using deepwell geothermal heat technology to power a district heating network, the first mixed use development in the UK to use this technology. This will result in an estimated annual saving of 550 tonnes of CO2 and will provide the opportunity for businesses locating to HALO to operate in a low carbon environment at an economic operational cost. “Both Scottish and UK Governments want to grow the economy and initiatives such as The HALO need public sector support to stimulate private sector investment. We are well advanced with our proposals, and we are doing everything we can to attract both public and sector investment in Ayrshire, and The HALO in particular”, said Marie.